I made this cake nearly a year ago and had forgot how good it was until I came across the photos. Then my mouth was salivating at the thought of the damp, slightly tart chocolateliness and I had to share the recipe with you. 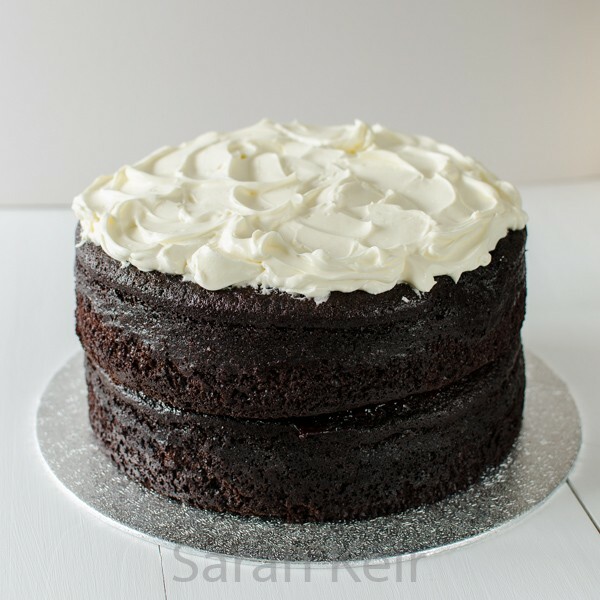 To be honest, you can’t taste the Guinness in the cake but it lends a slightly sour note to the cake which cuts through the sweetness; although I enjoy the occasional sugar rush, a balanced cake is much better to savour and enjoy in the long-term. 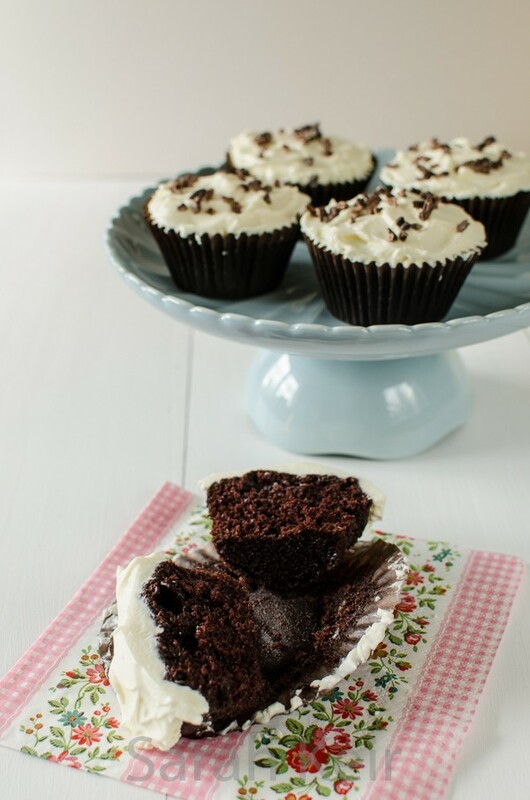 Although the cake is only flavoured with cocoa powder (make sure it is decent stuff), it is more than enough chocolately. 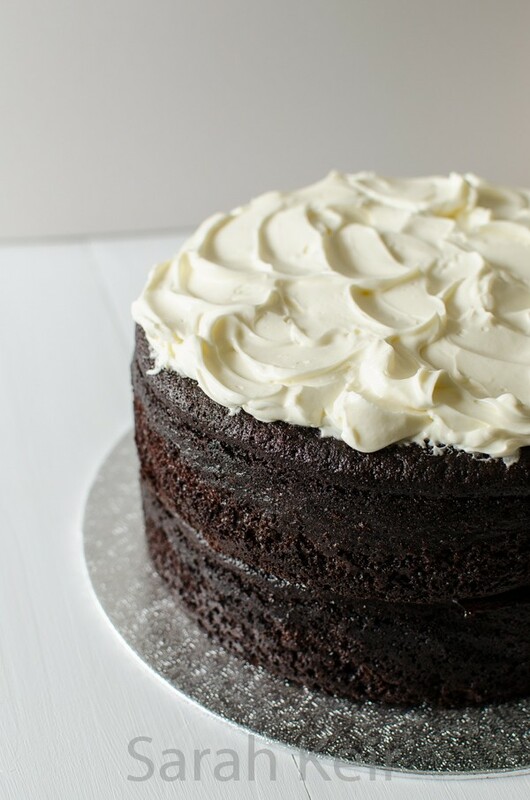 The slightly sweet, silky icing completements the cake perfectly and of course gives us the appearance of a frothy glass of Guinness. For the cake in the photos, I made the recipe twice and to make each layer thinner, made a 23cm cake plus half a dozen cupcakes. I stuck the two halves of cake together with some plum jam and double the icing was enough for the main cake and the dozen cupcakes. Make sure to line the sides and bottom of the springform tin well to make a water-tight seal and place the pan on a baking tray when placing in the oven as the batter is very liquid and will seep out otherwise. Recipe from Nigella Lawson’s Feast. Preheat oven to 180°C/160°C fan. Butter and line the bottom and sides of a 23cm springform tin. Pour the Guinness into a large saucepan and add the butter; heat gently until the butter is melted and then whisk in the cocoa and sugar. In a jug, beat the eggs, sour cream and vanilla and then pour into the beery mixture. Whisk in the flour, bicarb and salt. Pour the batter into the prepared tin and bake for 45 minutes to an hour until a skewer comes out clean. Allow to cool fully in the tin. For the icing, beat the cream cheese until smooth then sieve over the icing sugar and beat until smooth. Add the cream while beating and continue to beat until soft and silky. Spread on the cake once COMPLETELY cold.